MICHAEL KELLY The Marietta Times Matthew Taylor waits to spell Friday night at The Marietta Times Regional Spelling Bee. He won the competition, which lasted three hours. 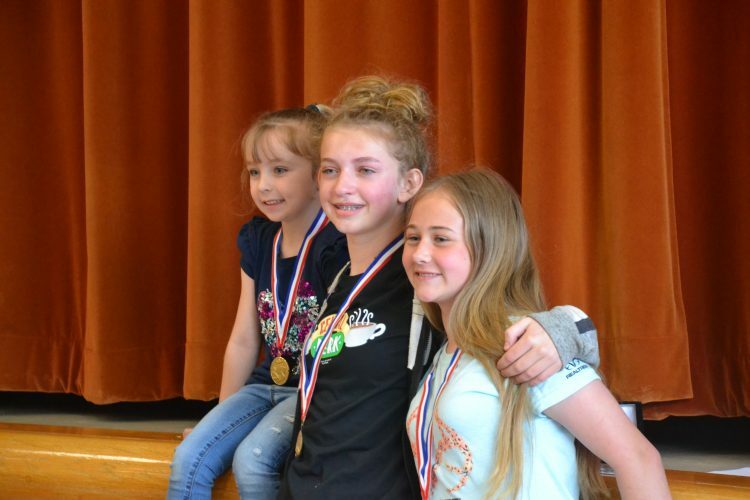 Taylor will advance to the Scripps National Spelling Bee in Washington D.C. at the end of May. MICHAEL KELLY The Marietta Times Matthew Taylor celebrates the end of a long evening, holding the trophy he won as regional spelling bee champion Friday night in the auditorium of Marietta High School. Taylor will advance to the Scripps National Spelling Bee in Washington D.C. at the end of May. 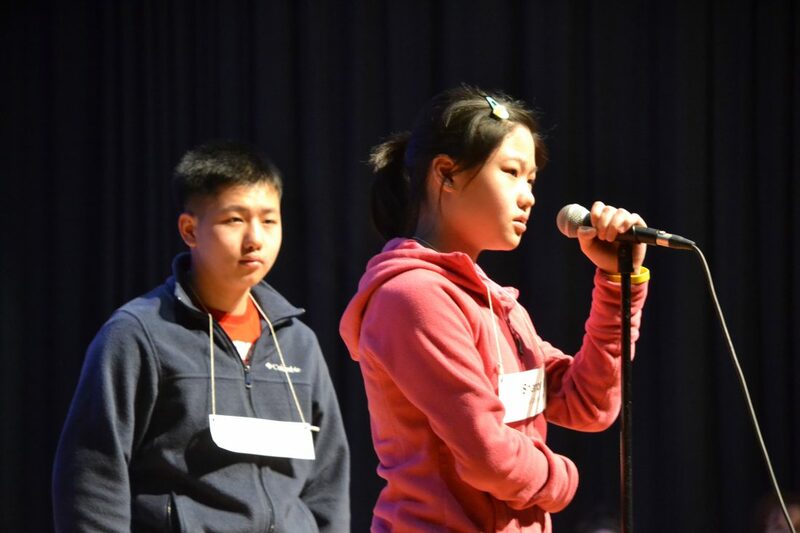 MICHAEL KELLY The Marietta Times Randy and Sharon Lin from Edison Middle School in Wood County stand to spell at The Marietta Times Regional Spelling Bee Friday night at Marietta High School. Randy finished third and Sharon, his sister, finished fourth. It started with reckless, but the evening was orderly. 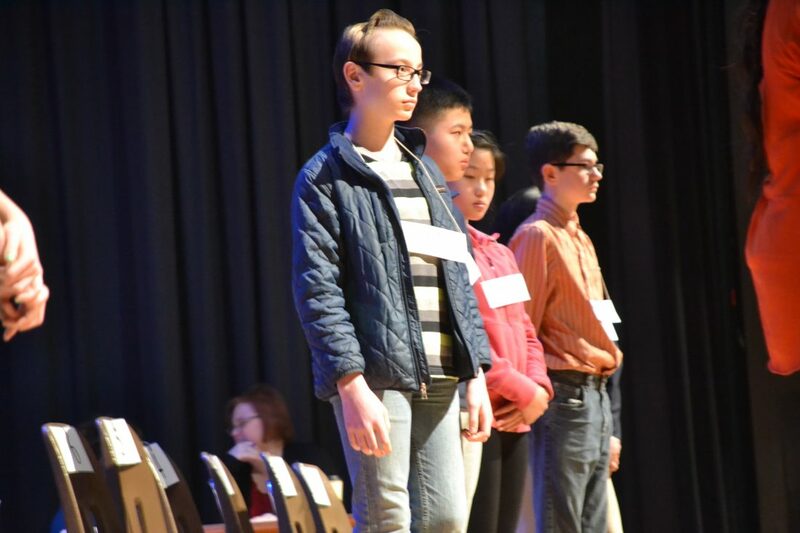 The Marietta Times 38th Regional Spelling Bee Friday night in the auditorium of Marietta High School saw nearly 60 spellers of every size and style. The word reckless, spelled with no hesitation by Cheryl Davis, was the first of the evening. Some spelled breezily, others with caution and deliberation, but over three hours all but one met their spelling nemesis. About a fourth of the competitors fell in the first round, taken out by familiar but tricky words such as magazine, dearth, aquatic, cockatoo, caboose and belladonna. The field was reduced to about 20 within an hour. Spellers asked for definitions, they asked for language of origin, they asked pronouncer Marietta College President Bill Ruud to use the word in a sentence. Some ended their spellings on a rising pitch, as if ending it with a question mark. At the beginning of the second hour, both ominous and angst lived up to their definitions, while seeming innocuous words such as syntax and implement also took a toll. Chagrin was the end of the evening for another speller. By 9:35 p.m., only two remained – Matthew Taylor, a seventh grader at Williamstown High School, and Tate Ayers, a seventh grader at Marietta Middle School. The two traded words for nearly 30 minutes, with the judges resorting at the end to random selections from the dictionary. “I won’t forget that word,” Ayers said, vowing to return next year. Taylor admitted he had to guess at some of the non-English words toward the end. “I was just putting out letters and hoping with some of them,” he said. Taylor had made it to the regional bee before but not placed. 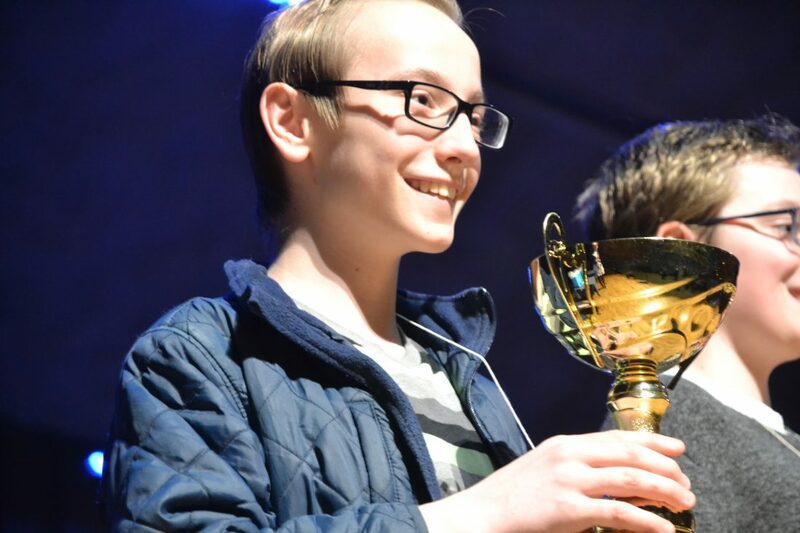 His father, Joe Taylor, said the family is looking forward to the trip to D.C. for Matthew to compete in the Scripps spelling bee, representing the region. “All my sons are active in extracurricular, but this is something beyond that,” he said, and gave credit to his wife, Tina, and Matthew’s brothers. 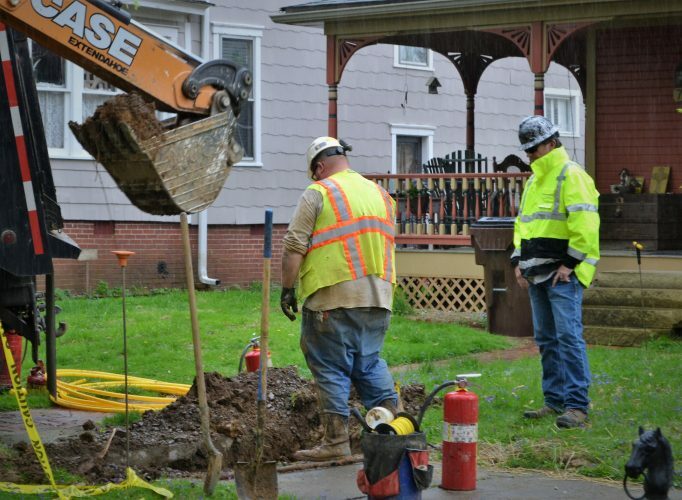 “They helped, and this was their hard work, too,” he said. The bee was sponsored by The Marietta Times. The emcee for the evening was Christina Myer, executive editor of The Marietta Times and the Parkersburg News and Sentinel. The winner earned the right to participate in the Scripps National Spelling Bee, to be held from May 27-30 in Washington D.C. This year marks the 93rd year for the national bee. •Winner: Matthew Taylor, Williamstown High School. •Runner-up: Tate Ayers, Marietta Middle School. •Third: Randy Lin, Edison Middle School. •Fourth: Sharon Lin, Edison Middle School. •Fifth: Maggie Morris, Veritas Classical Academy. •Winner competes in the Scripps National Spelling Bee Washington D.C., May 27-30.